EATOPS worked on the preliminary design of a portable control panel to activate the civil defense siren system in Norway. The touch control panel is designed following a 3-click navigation approach to activate the x1300 sirens at the country-region-district and sub-district level. A control room layout solution (in a pre-study phase) monitors a broader range of assignments connected to major or special incidents (fires, natural catastrophes, oil protection, searches, evacuation, etc...). EATOPS is given the assignment to troubleshoot a memory leak in a control system deployed on onboard an oil tanker in operations in the Netherlands. The leak was identified and resorbed using two different methods: (1) injecting a watchdog inside the code functions as well as (2) dichotomy. The control system was virtualized in order to avoid interrupting operations. EATOPS would like to thank the SchneiderElectric CitectSCADA 7.40 team in Sydney for their remote iterative testings as well as their availability during week-ends & early day shifts. This project is a good example of cross-collaboration between Schneider Electric and one of its system integrators. EATOPS will be present at the event & set-up meetings to discuss its on-going projects using TETRA networks with its business partners. More about Critical Communications 2016 - Amsterdam - May 31st, June 1st, 2nd 2016. Mobile tablet computers have made it inside the control room replacing the traditional touch display very often used for the voice matrix or task scheduler. In this hardware update of the RIVOPS console the tablet PC is embedded as part of the table top. This touch-screen is ideal for: audio-voice-loop selection, fault-scenario selection or an alarm overview panel. Compatible in various dimensions with the Wacom Cintiq product range and Microsoft Surface. EATOPS included the latest stylus-touch-based tablet from Wacom into its RIVOPS console layout. This evolution is a response to the use of tablet PC equipment inside the control room. More on Wacom Cintiq Companion 2 console available soon. Automatic generation of your OPC communication tables is just one click away. AutoGenforOPC is a script written in Python which parses your IO-list and automatically generates your OPC sever configuration files. It saves you of a day of work, without mistakes! AutoGen is compatible with Siemens Step7, Automation Studio 4.2, CodeSys, & RIVOPS. OPC EATOPS products are compliant with OPC stacks v1.3.1340. Watch the SwissCube live operations from our Noordwijk control room & secondary ground segment. RIVOPS supports OPC UA (unified architecture, OPC Stack 1.3.340) for both DataAccess (DA) and AlarmEvent (AE). The new standard is compliant with the ISA 18.2 requirements on dynamic alarm arouping, alarm acknowledgment, display of advisory messages and alarm shelving mecanisms. EATOPS develops its expertise in using the standard to anticipate the growing demand related to Industry 4.0 and Industrial Internet of Things. 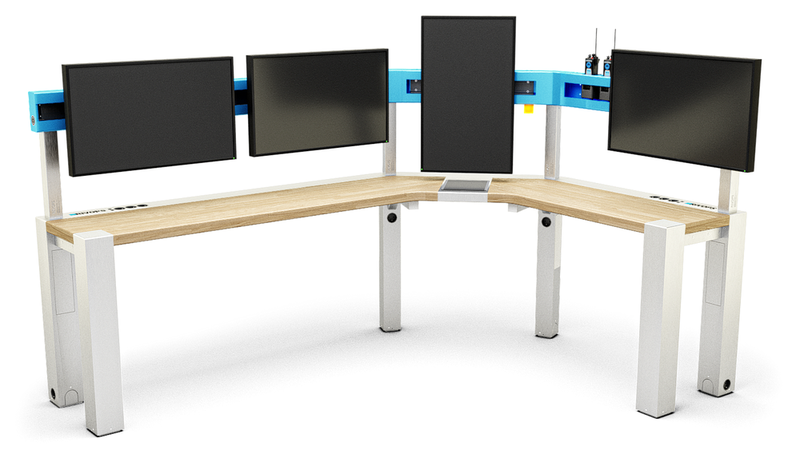 EATOPS produces 2-dispatching console ISA-18.2 compliant for the Air Traffic Control market. The console are equipped with a Motorola SCADA using a VHF Tetra infrastructure. Both consoles include a RIVOPS alarm overview panel. The introduction of VHF/UHF modems and remote terminal units -RTUs- within the core skillset of the company comes as a natural step after the SwissCube mission, 2009-2016. The telemetry is transfered at low bandwidth using a UHF/VHF Tetra infrastructure which is often use in critical operations (airport management, fire service ambulance, olympic games monitoring, police stations, pipeline monitoring, Suez Canal infrastructure, etc...). EATOPS ships a 1-operator console to Production Unit Asker, MHWirth in Norway. EATOPS releases an automatic fault-detection module. This piece of software is embedded at the lowest level of the process & control logic, directly inside the PLC code. This alarm grouping module is compliant with the 1 Hertz response requirement for Safety Alarm Systems (SAS). 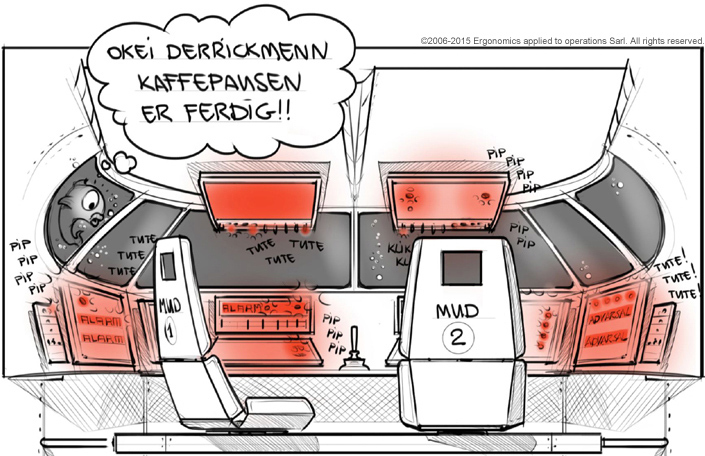 Norwegian/English translation: "Okay derrickman, the coffee break is over!" Sales -- Control system upgrade for DRILLVIEW -- Aker Solutions A.S. In response to Statoil TR1494 on Alarm Management, EATOPS is contracted by Aker Solutions A.S. to upgrade its DRILLVIEW control system. The mud control room (PLC+HMI) is equipped with an alarm reduction module. As soon as an alarm scenario is identified, alarms are automatically compacted under an alarm header (also called parent-alarm or alarm group). The drilling package is ISA 18.2 compliant in the sense that it automatically cleans the alarm-list of the nuisance alarm messages. On the other hand, an advisory message is given to the operator suggesting him the way forward. The solution is now part of the production line, ready to be deployed on every new-built vessels. The control system software architecture remains compatible with older semi-submersibles allowing the company to retro upgrade its existing offshore installations. 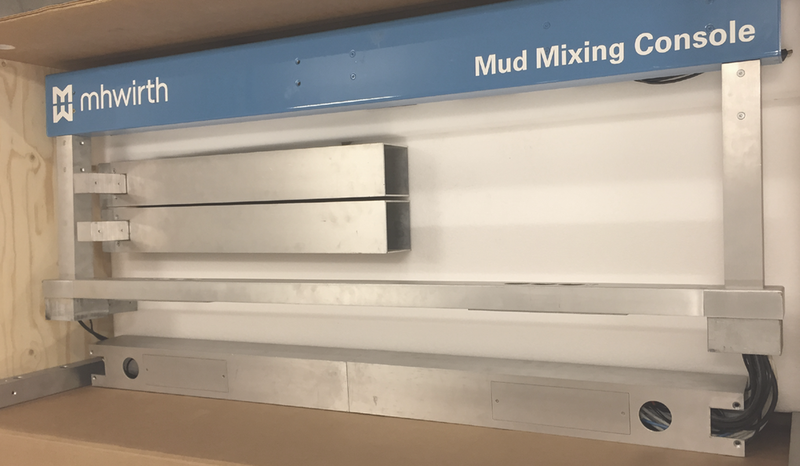 This touch control panel displays the flow direction of the mud from pit to pit to the derrickman. Having a Mud-Flow overview control panel improves the awareness of the crew during drilling operations. This software implementation was developed on the top of a PLC control software. It gets its inputs data from the SCADA system (Citect OPC DA, Schneider Electric). The challenge during the software integration was to script the automatic detection of valid trajectories and possible flow directions from a 3D CAD model of the plant. This type of panels is well suited for Mud Mixing Systems of third category. For more information on Automatic Mud Mixing System, the Derrickman console or Mud-flow overview panel, please contact our nearest distributor. 3D SCADA, a mud-transfer system for a drilling vessel. Delivery of RIVOPS sliding brackets to Saipem Norge. Installation is performed on Scarabeo-8 by our Norwegian distributor Advanced Control A.S. Provides support to the automation engineering team at Aker Solutions. EATOPS joins the 'first interactive' division working on PLC software testing & simulation. EATOPS is following LabView trainings to test the performances of the RIVOPS runtime. A simulated alarm rate per second is used as an input to the RIVOPS OPC drivers. TUGraz will make use of a 2-seat console for the operating the BRITE satellite mission. TUGSAT-1 was successfully launched on February 25th at 1331 (CET) 2013. First successful contract occurred 3 hours after launch during the first orbital pass over Graz (Austria). Performing an update of a Fire & Gas detection system at Kristiansund, Norway, Lat. 63 deg N.
Performing a software update onboard Scarabeo-8, in Hammerfest, Norway, Lat. 71 deg N.